If you know me in real life, you know I have an unhealthy love for Chuck Norris. Who could help but love a guy who is so awesome?! Less known about Chuck are his thoughts on natural birth. Of course, I agree with him. Let's take a look. ~Since Mr Norris is incredible, he could of course give birth, even though he is a man. But he wouldn't because he respects women too much. ~But if Chuck did give birth, he wouldn't do it on his back. He COULD, because, let's face it, he can run around the earth fast enough to punch himself in the back of the head. But he WOULDN'T. Because nobody tells Chuck how to give birth. And if they did, they would regret it. For about 10 seconds. Then everything would go black. ~If Chuck gave birth, he would do it naturally. Chuck is a precision athlete. Death is afraid of him. This is not a man who believes in epidurals. The needle probably couldn't penetrate his spine anyway, but he wouldn't let it, because he knows that in order to experience peak performance, you must be free to move and free of drugs. ~An IV? NO WAY. First, needles can't puncture his skin. Second, Chuck drinks his fluid through his mouth, the way it was intended. Plus, who wants to look all bloated when filming Walker, Texas Ranger? ~Hospital gowns? Not on your life. Chuck's boots simply don't go well with hospital gowns. Plus, even Chuck Norris isn't taken seriously if you can see his tail end every time he walks down the hall. Pants always beats no pants. ~The words, "They Let Me" have never passed Chuck's lips. We are talking about a man who has dinosaurs HIDING FROM HIM (No, they are not extinct, they are hiding from Chuck Norris.) Chuck doesn't let anybody determine what he can or can't do. Chuck is in charge of Chuck. The End. 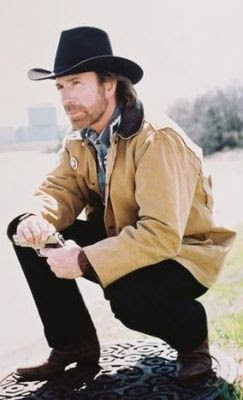 ~Would Chuck allow a vaginal exam while he was pregnant? Would he even want one in labor? Are you kidding? Chuck knows that his baby will come when it wants to come. He doesn't need to know how dilated he is so that an expert can "guess" about time of birth. Who stays clothed until he wants to get naked? ~Does Chuck allow somebody else to "predict" a "due date" for the Chuck baby? Chuck's baby comes when Chuck's baby is ready. A man who can count to infinity twice, can have a baby come whenever he darn well pleases. ~Immediate cord clamping? Did you know Chuck Norris was in Star Wars? He was the FORCE. Why on earth would somebody like that want his baby to be denied any precious blood? No way in heck. The Chuck baby gets all the blood it needs, because everybody knows that stuff is powerful. THAT. IS. AWESOME. Made my morning, thank you. Who doesn't love Chuck Norris? Thanks for the laugh. I can see from the photo that he's got squatting down...always a good natural birthing skill, lol. you are such a freakin' GENIUS!!! love love love you and made evenbaby boy giggle too! I fondly remember laughing while your babe was in your belly over the Epic Eden dinner table about ol' CN. love YOU!!! Awesome post! Thank you for the good laugh! I pretty much love everything you've ever written, so I'm sorry, but I hate it. Why does it always have to be a man that's the strongest/best. UGH. I need my morning coffee. Sounds like Chuck Norris might just be "the MOST interesting man in the WORLD!" He doesn't give birth but if he did he would do it al naturale!! LOL! Best line: "Pants always beats no pants." This was hilarious. Absolute, hands-down, creative, genius, hilarity. I mean, seriously. This was just really cute, clever and awesome. This may be my favorite post of yours. I love when people can tackle real and informative issues with humor. Not that you were trying to tackle anything. Only Chuck can truly tackle.